Analysis of Destiny’s Release Timeline, And How Will Rise of Iron Fare? Publisher Activision-Blizzard ($ATVI) released its shared-world space shooter Destiny back in September 2014, and the game has been on an interesting timeline ever since. Developed by Bungie, best known for creating the early games in the Halo series, the genre-bending title started strong out of the gate by racking up around $325 million in sales (sold-through to consumers) in its first week. It overcame a well-documented difficult development cycle and mixed critical reception to become one of the most financially successful launches in the history of gaming. In the two years since, it has garnered both praise and critique from critics and gamers alike for its mix of online elements, top-rate FPS mechanics and (most recently) cosmetic micro-transations in which players can buy in-game items for real-world dollars. Also, Activision has offered incremental paid expansions in the form of “content drops” by the names of The Dark Below, House of Wolves, The Taken King and finally Rise of Iron which is slated for release tomorrow. Each of these expansions built on (lots would say improved) the original game as Bungie updated its economy and systems plus offered new missions and raids (multi-person, complex quests with big rewards), but also costs consumers money as gamers were charged an additional fee on top of the base game. Whether you are a fan of this trajectory or not, the game has amassed a huge following with around 30 million registered users who spend an average of 3 hours playing even years later. To track its progress individually and overall within Activision as a whole, below I’ll offer a handful of indicators. 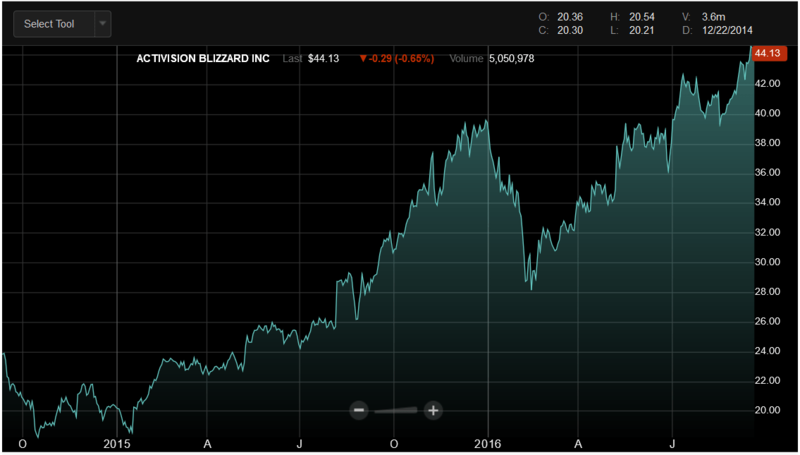 First is an overview of the firm’s stock price since Destiny’s original release two years back. You’ll see its price in September 2014 was $23.73, and it’s now grown to around $44 per share this week. During this time, the publisher’s market value has increased by $10.9 billion. It’s true that there are a variety of factors that go into a firm’s share price, among them the broader economy, performance of additional products (Activision-Blizzard also publishes popular games such as Call of Duty, World of Warcraft and Overwatch), mergers such as the acquisition of King Digital and general investor sentiment, but Destiny is a key part of the publisher’s portfolio especially when it comes to generating recurring revenue. The content packs I mentioned before create a revenue stream similar to a subscription-based title like WoW, as opposed to say Overwatch where new characters and maps are offered for free and the only additional revenue comes from cosmetic items. Speaking of recurring revenue, Activision as a business unit within the overall company has found a way to generate ongoing sales via its continued updates for Destiny. 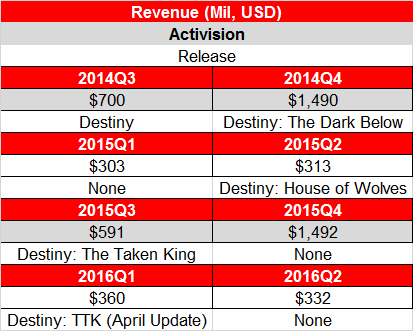 A snapshot below shows the unit’s revenue numbers alongside each corresponding Destiny release. General theme is that other than the year-end holidays, a Destiny release over the past two years has meant slightly more revenue than “non-Destiny” quarters. Again, caveat is that the publisher produces other games, of course, but it’s interesting to see sales aligned with an estimate time frame of when each expansion came out. Lastly, I’ve tracked results in the U.S. games market of the title and its expansions according to the NPD Group, a data provider for the games industry. Upon release, it was the #1 selling game in September 2014 followed by #5 in October 2014. During some of its expansions, it reemerged in the Top 10 especially during Destiny: The Taken King, as this was billed as the largest expansion yet and had the most content. Note that this only tracks the U.S. physical games market prior to a couple months back, but it gives a good sense for how games perform at release and with updated content throughout their life cycles. Destiny is one of the few titles in recent memory that has been a Top Ten regular on-and-off since late 2014. 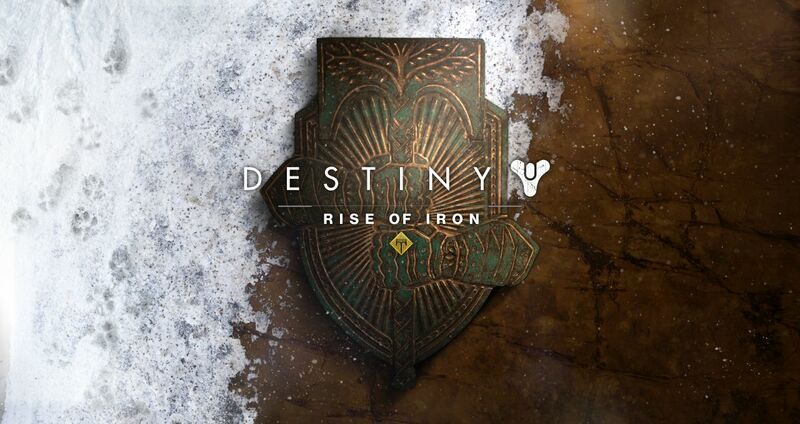 With Destiny: Rise of Iron expansion planned for release tomorrow, how will it fare? Can it again capture lapsed players (including myself) and provide revenue stability? When it comes to Rise of Iron, its content is more aligned more with The Taken King than some of the smaller ones, as it offers multiple missions and the first brand new raid activity in a year. With that comes a higher price tag ($29.99) than the smaller releases of course, but this also provides upside for its sales potential. 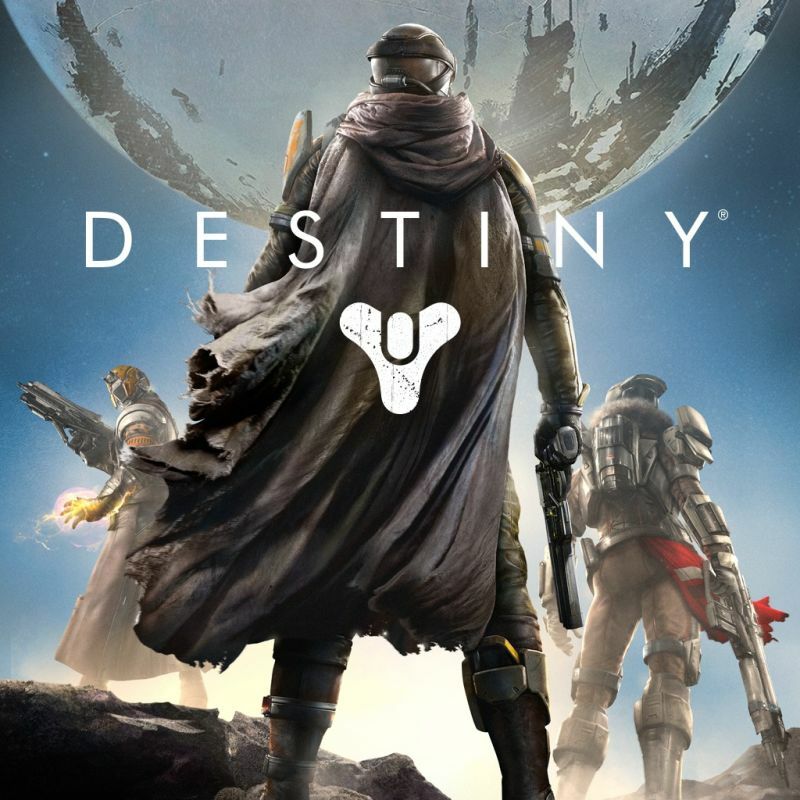 In the absence of a sequel to Destiny, which isn’t expected until next year, and a release date prior to the big blockbuster releases in the same genre like Battlefield 1, Titanfall 2 and Call of Duty: Infinite Warfare, I think that Rise of Iron will perform about as well as The Taken King, with a Top 5 showing in NPD for September and Top 10 for October, and sales momentum into the 3rd quarter plus holidays that will support Activision’s segment revenue. However, I do not expect Rise of Iron to have the legs of The Taken King, as the aforementioned blockbuster titles will take gamers away and then early 2017 titles such as Horizon: Zero Dawn should overshadow it. Do you think that Destiny: Rise of Iron will sell as well as Destiny: The Taken King or somehow the original game? Are you a lapsed player than plans on jumping back into the game this week? I’m interested to hear! Shoot me a note or comment here.